I pride myself in the time-honored tradition of great fitting garments having a unique style and unquestionable quality of construction. I specialize in tailored women’s jackets, blouses, tunics and dresses (other than wedding gowns). I strive to create garments you will grow tired of long before they wear out. Initial consultations are free. 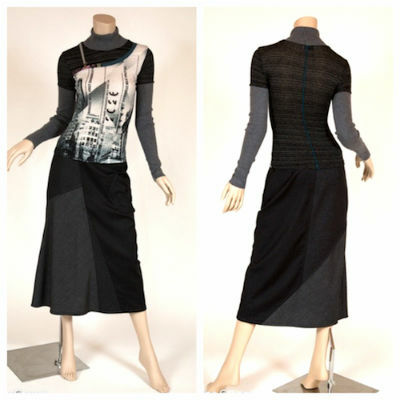 I create patterns and garments specifically tailored to your needs and desires. As a part of the custom process, I will take all the necessary body measurements required to create a fitting muslin. I will use the fitting muslin as a reference for all future projects, and pattern making, to ensure a perfect fit. I will approach your project as if it were my own, drawing from and using all of my sewing talents and abilities, in order to create a unique, one of a kind garment, just for you. I am highly skilled in fabric selection and will help you select appropriate fabrics and notions complementary to your color palette. Fitting- I pride myself on a good fit. In addition to fitting as a part of my Custom Couturier services, I provide commercial pattern fitting services for home sewers and fashion students at an hourly rate. I have been refashioning garments for men and women for many years. Our initial consultation will take place in your closet. We’ll examine everything you are wearing and what you are not. We’ll talk about why you are keeping the things you are not wearing and what we could do to change them into something you will wear. Magazine clippings and current fashion trends will help guide us in coming up with new designs. If you have a favorite item in your closet that you wish you had more of, I can copy it. I am trained in several methods of copy-ready-to-wear and have many successes in this area.